A. 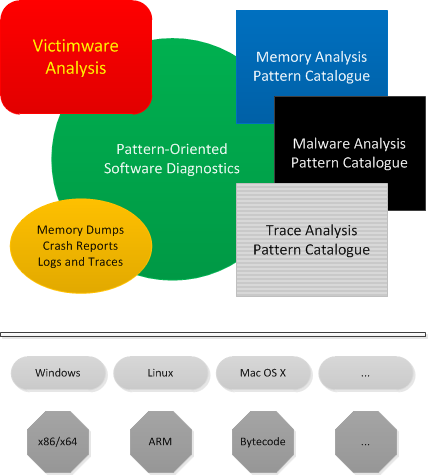 The approach of Victimware1 (which includes abnormal behaviour of Malware such as crashes, hangs, resource leaks, CPU spikes) together with memory, malware, and log analysis pattern catalogues allows to detect unknown malware in software diagnostics and digital forensics artefacts such as memory dumps, crash reports, and software traces and logs: pattern-driven software diagnostics2 and forensics4. B. Structural and behavioural patterns found on one operating system and/or processor architecture can be predicted for another: pattern-based software diagnostics3 and forensics4.